If you’ve visited any Hollywood blockbuster’s Web pages, you’ve probably seen site intro movies. They’re short, eye-catching Flash animations that introduce a site’s content. 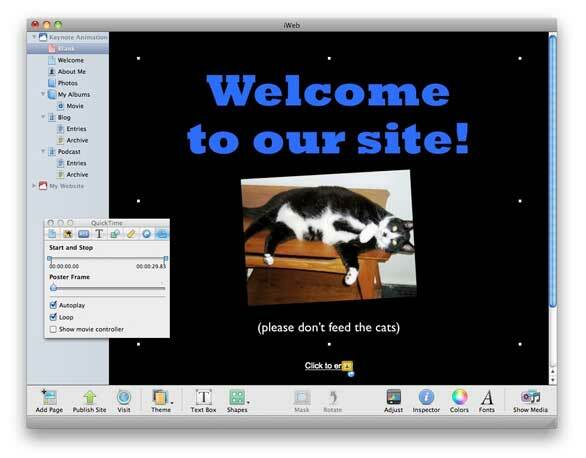 With Keynote '09 ( ), you can create a snazzy QuickTime intro for your own iWeb ( ) site. Once you complete the simple project below, you’ll be ready to experiment and create something special for your site’s visitors. Here’s how to get started. 1. Select File -> New Page. Add a Blank page from a theme you like, and give it a descriptive name. Delete unwanted placeholder text and shapes, then select View -> Show Inspector. In the Page inspector, click the Page button. Uncheck the Display Navigation Menu and Include Page in Navigation Menu options to differentiate the intro page from the rest of your site. 2. Select Insert -> Shape, and choose Rectangle. Drag the shape’s handles to the size you want your movie to be. Bigger is better, so make it at least the width of your page. Note the shape’s dimensions in the Metrics inspector. A placeholder shape in iWeb lets you make an intro that’s the right size for your page. 3. Select File -> New From Theme Chooser, and pick a theme that suits your site. Select View -> Show Inspector, and click the Document inspector’s Document button. In the Slide Size pull-down menu, choose Custom Slide Size and enter the iWeb shape’s measurements to make your slide the same size. 4. Edit placeholder text to deliver a greeting to your visitors. To further customize text, choose View -> Show Format Bar, and change the font, type size, and more with the options below the Toolbar. 5. Add media. 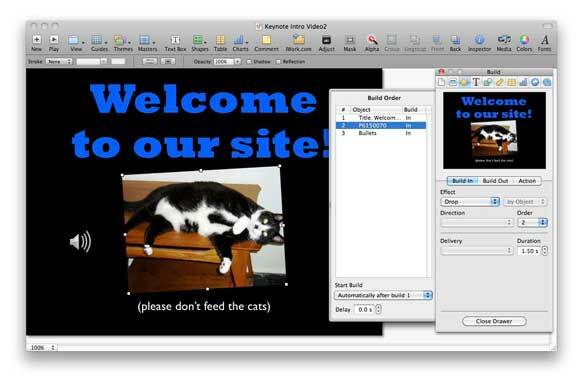 An intro should reflect your site’s content in an entertaining way. For me, that meant adding a picture of my cat and a little music. Your media and flashy animations can add eye candy to your site. To add media, select View -> Show Media Browser. Click the Photos button and drag a picture onto your slide. Click the Audio button and drag in a song (don’t worry, its icon won’t appear in your intro). Note that your intro movie’s length will be the same as your song. To shorten a song, select its icon and adjust the Start & Stop slider in the QuickTime inspector. You can also add a movie to your slide from the Movies browser, and its length can be similarly adjusted. 6. Add animations––or builds––to elements in your slide with the Build inspector. The Build In button controls how objects appear in your intro; the Build Out button controls how objects disappear; and the Action button lets you change an object’s appearance in-between. Other options control build durations and the order in which they occur. To keep things simple, just select each element in your slide and give it a Build In effect. Don’t be afraid to get flashy. For instance, I set my title text to appear with the Orbital effect and my picture to Drop into the slide. Click Play in the Toolbar to review your intro as you work. Click the More Options button, then select your builds and set them to start automatically so they play consecutively in your exported QuickTime movie. Note that you can rearrange when builds take effect by dragging and dropping them in the Build Order drawer. 7. Export your intro by selecting File -> Export, then click QuickTime in the resulting sheet. Set the Playback Uses pull-down menu to Manual Advance and the Formats menu to Full Quality, Large. Check Include Audio if you added music, and then export your movie. 8. Finish the job in iWeb. 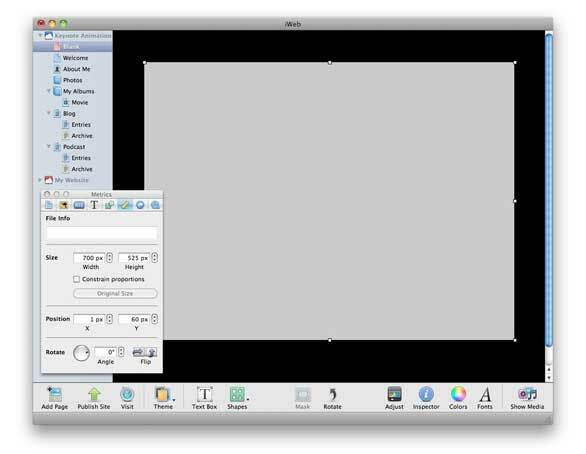 Drag the movie onto your blank page, resize it to fit your placeholder shape, then delete the placeholder. In the QuickTime inspector, check Autoplay so your intro begins when the page loads, and uncheck Show Movie Controller so it isn’t cluttered by playback controls. To make your movie play continuously, click Loop. iWeb’s QuickTime inspector lets your intro movie play automatically and without distracting playback controls. 9. To link to your main page from this intro, Select Insert -> Text Box, then drag the page you want to link to from iWeb’s sidebar into the box. Select the text and rename it something appropriate like “Enter here.” In the sidebar, drag the intro page to the top of your site so it will be the first page of your site to load.